Within the range of cosmetic dentistry available at Ringwood Dental Practice, tooth whitening is a popular choice. As we’re sure you are aware, drinking tea and coffee and the occasional glass of red wine can eventually take its toll on our teeth and may darken their natural whiteness. Alongside a thorough oral hygiene routine, there are ways to bring back the sparkle to your smile. If you fancy going a little brighter and whiter, we offer two types of treatment – both clinically proven to be safe and painless. - Zoom! This revolutionary method of teeth whitening has been featured on Channel 4’s “10 Years Younger” and can leave your teeth ten shades lighter in forty-five minutes. The technique uses controlled light to activate hydrogen peroxide in a gel that is painted onto the tooth’s surface. Of course, we’ll discuss how bright you want to go beforehand, so that you can be happy we’ve got the right shade for you. - Home-based overnight bleaching. 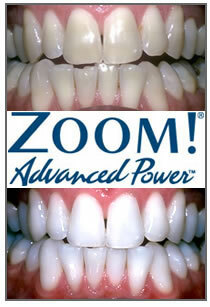 We create custom made bleaching trays for you to wear at night over a set period of time. This home-based bleaching method puts you in control of the level of whiteness. It is widely agreed that teeth whitening procedures are one of the safest treatments in cosmetic dentistry. With the Zoom! method of whitening, we are careful to ensure that all of the surrounding soft gum tissue is protected, and we provide protective eyewear for you during the procedure. Is teeth whitening available to me? Both Zoom! and home-based overnight bleaching are suitable for the majority of our patients. For specific enquiries, it’s best to speak with our dental team. Ringwood Dental Practice is conveniently located within the areas of Southampton, Bournemouth, Poole, Salisbury and Christchurch. Dr Dhatt utilised ZOOM teeth whitening and cosmetic contouring to produce a same day perfect smile.